In the past we have had a very large Sunday Club, but sadly over the years it has dwindled dramatically. 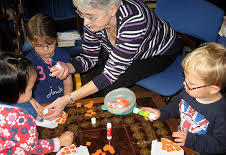 At present we have a small nucleus of children who attend regularly but the numbers can increase to varying degrees depending on how many children are visiting grandparents on the day. The Sunday Club, which meets every Sunday morning at 10.45 am, spends time in the Church Service before going in to classes. 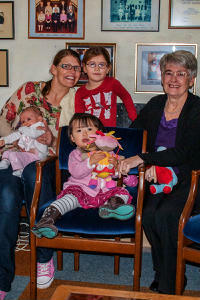 There is a crèche for the younger ones and all are helped by others as numbers demand. 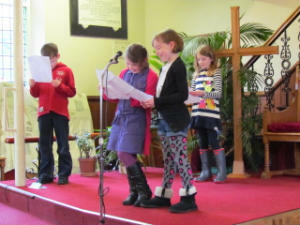 The Sunday Club use Scripture Union material, following the same subjects as are used in Church, and on some Sundays we return to church near the end of the service to share with the congregation what we have learnt. 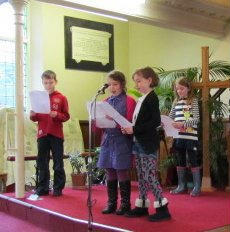 The following photos were taken of the Sunday Club as they performed a drama during a morning service. We would welcome any children who would like to join with us.